At our faculty meeting today, author James Burnes came to speak about the “3 Rs” in education; specifically, he was referring to respect, responsibility, and relationships. He has written several other books on bullying and is associated with http://bullyproofclassroom.com and tweets at @jameshburnes. Relationships is one aspect in particular that I focus on with students and with other staff members that I work on. Creating and fostering a culture where people genuinely about each other is tremendously beneficial for learning. One of the points that spoke to me during the session was on developing perseverance. This correlates with recent research I have read about education in Japan. It is alright to allow students to struggle somewhat to help them develop determination, perseverance, or toughness, although it needs to be done in a safe and supportive environment. 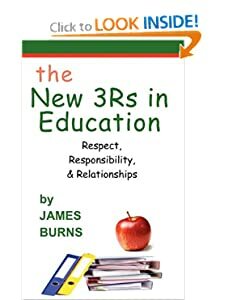 Speaking with James Burnes before the meeting, he offered to give me one of his book The New 3Rs in Education: Respect, Responsibility & Relationships to give away on this site. All you need to do is leave a comment describing something that you or your school is doing to improve the culture in your school. A winner will be randomly chosen on Monday 4/15. Overwhelmed By New Tech? You’re Not Alone. Recently, talking to teachers both in person and online, I’ve noticed a common trend, one of feeling overwhelmed. Specifically, feeling overwhelmed trying to keep up with all of the new technolog. People outside of education may not be aware, but teachers have a lot on their plates: rewriting curriculum to the common core standards, differentiating instruction for all of their students, paperwork from the office, planning, grading, etc… in addition to, you know, actually teaching. With the extreme workload many carry, one can see why it would not take much to become overwhelmed. The flow of information and new tools comes from every direction: Twitter, emails (Yes, I’ve been labelled an over-sharer at times. ), Pinterest, colleagues, administrators, blogs, and any number of other avenues. For many people, especially those who want to integrate technology but haven’t had a lot of experience doing so yet. All of the sharing of resources and techniques is wonderful; it’s something I try to promote at the local level as well as through social media. We thrive when we help and support each other. The problem occurs when all of the sharing develops a feeling of guilt in those who are receiving the ideas. I’ve had these discussions with teachers in buildings I’ve worked in (the tech department or the administration sharing regularly) as well as teachers online following Twitter feeds. Guilt should not have a place here. There are a few points I usually try to make in these conversations. The fact that you are feeling guilty shows that you care and still are trying to improve your practice. This is important and to your credit. There is no need to try to keep up or try every idea that your tech person or administrator sends your way. There is a reason that technology coaches/facilitators/coordinators and library media specialists make keeping up with technology trends a major part of their job. They can help. Lean on them. Stick with what fits. When we are integrating new technology, always start with the learning objective. What do you want the students to learn and do? This should guide your decision making. A lot of resources are out there, but not all tools will fit all purposes. If you try to force something that does not fit, it will not work to its full potential. In a given time period, try to pick a tool or a technique and go more deeply with it. For example, we’ve been focusing a lot on digital storytelling at my school in the elementary grades. It started out just as another means of creative writing, but now students are also using it as a means to explain science concepts. Train students in how to use a tool and then explore the different applications of it with them. Using a tool deeply is arguably much more beneficial to students than using many superficially. As you master a tool, consider offering to share how you use it or even co-teach a lesson (if your school allows for this). Teachers rightfully are much more likely to accept the utility of something when they see a colleague having success using it to help his/her students learn. Technological guilt seems to be unfortunately common. As long as we are trying to thoughtfully use technology to improve student learning and change our practice, we are moving in the right direction. I use Facebook fairly sparsely, but I am on the network. I mostly use it to share pictures of my kids with family and talk to some educators who have I become friends with other the years. Although I use Facebook as a tool since it is where most of the users are, I would not use the word like or trust when discussing the network after the many privacy blunders that they have had. This morning, I checked Facebook before I went to week. I was surprised to see a post from over a week ago by my friend and technology teacher Kevin Jarrett. A few red flags popped up. There was nothing off about his post; I have even commented on it at the time. It was the second post in my iPhone news feed, where Facebook usually inserts mobile advertisements. There were no new comments. Nothing was marking as important that Facebook’s algorithm should have placed it so high in the news feed. Then, I noticed something. I teach digital literacy and how to analyze a website for trustworthiness. One of the ideas that I stress with my students is that it is extremely necessary to do this in everyday life, not just when doing a research paper. Looking closer, I saw, in small nondescript font that it is a sponsored post. Assuming that if Kevin was going to sponsor his own post (which you can do now), he wouldn’t it on promoting a gadget, I figured that the company that was written about in the post saw it and decided to “Promote” it. Just to be sure, I wrote Kevin and it seems that is the case. This feels like a very sneaky way to insert advertising. I do not have a problem with targeted advertising in general. If I have to look at ads, I’d rather they relevant to things I’m actually interested in. The catch is that I shouldn’t have to figure out that they are ads. I hav e clicked on 1 Facebook ad ever (for a race I was already thinking of signing up for) and less than a dozen on Google (which I use a lot more); I will click an ad if it seems interesting and worthwhile. Few do, so I do not. If a friend recommends something, I might be more inclined to check it out. Slipping in a recommendation that a friend made, without telling him that his post is being used or making it clear that it is an add, seems to be putting Facebook on another path towards owning and profiting off of both its users and their content. Our kids need to be aware of these practices and to be able to identify them on the fly so that they are not manipulated. When I look back to when I started at my school in July, a lot of progress has been made. One of the areas we are trying to improve is culture and professional development. Specifically, making professional sharing a normal part of what we do and better utilizing the limited amount of time we get to spend together. A large amount of the planning credit goes to my superintendent, Jill Dobrowansky, who thankfully understands that we need to improve and differentiate PD, making it more focused on what the teachers actually need. Before I get into the post, I do not want this to sound like all the things that are going on are attributable to me. Thankfully, I work with a wonderful staff and we have a good culture in the building; those elements are essential to trying the things that we’ve implemented this month. This started with our monthly faculty meeting on Feb. 4. We “flipped” the meeting, which I am a much bigger fan of in professional settings than classroom settings because I know all of the teachers have access. One of our areas of focus as a school is on improving student writing. So, having teachers break into grade level groups, we sent out a few different topics with the expectation that the faculty meeting would be used solely for collaborative planning, playing, and brainstorming. We used Meraki to send out the Story Wheel app to the Pre-K-Grade 2 teachers’ iPads and Toontastic to the Grade 3-4 teachers’ iPads. We sent a short video introducing using Google Docs for writing the Grade 5-8 teachers as we are hoping to go live with the students’ Google Docs (Drive) accounts this month. The hope is that they would try out the apps or watch the video depending on which grade they teach. The feedback from the teachers was overwhelmingly positive. The collaboration going on was excellent. The teachers were all leaving with concrete, easily actionable plans that they could use in their rooms. At least some of each group has already integrated the ideas in their teaching, some with me co-teaching and some on their own. This is not to say that everything went perfectly, but it is easily the best faculty meeting I’ve been a part of. Today, we actually tried to implement the EdCamp model in our professional development day. The first half of the day was just alright; we had to spend the morning in Teachscape training on the Danielson evaluation model. It’s an important topic that greatly effects every teacher in the building. For those of you who are unaware, an EdCamp is a specific type of unconference that is run by teachers. It is free for all to attend. Teachers present on whatever they feel relevant and teachers can choose what they want to learn about. I plugged it several times today and hope to drag some of my colleagues to the next one that comes along (Maybe EdCamp IS on 3/2. Anyone going?). I led an iPad Bootcamp session. It was a lot of fun experimenting with different apps for different grade levels and content areas from PreK through middle school. Rebekah Triolo led one on a toolkit for common core standards in language arts. Melissa Mattix led a session on QR codes (they’ve been spreading in the building since she started using them). Susan Kotch led a session on back channels, which she is pioneering with her eighth graders. They’re now asking their other teachers to use it which is always a good sign. Kathy Yaede and Lisa Chapman led a digital storytelling workshop focusing on Voicethread, Toontastic, Story Wheel, and Puppet Pals. Their students have already produced some outstanding examples. Gina Narozniak and Dave LaVeglio led a workshop on problem-based learning, with examples that their students have done. I led a conversation about Edmodo with a small group and I believe we are going to start piloting it with at least 2 classrooms soon. Since I was helping in session both time lots, I didn’t get to see the other sessions. Jill went to all the sessions and left impressed. I’ve gotten great feedback from some of my tweeting colleagues. Overall, everyone seemed to be in a great mood and really like the time to share and work together. I need to talk to everyone and unpack everything that happened during the day. It was a very positive experience and I hope to see it expand in the future. Great things are happening and I can’t wait to see where we go in the years to come. I recently went to my first Techspo conference. Like any conference, there were high points and low points. My reflection may be a tad biased. Over the last several years, a significant portion of my personal professional development has been from Twitter and unconferences. I have personally staged two unconferences (the inaugural TeachMeets in NJ and TN) and been to probably a dozen. I also want to state that, having been connected with him on Twitter for some time, I have a lot of respect for the organizer and know that he has great intentions and put in a ton of work to get the conference setup. One interesting aspect of the conference is the ratio of superintendents, administrators, and technology directors/coordinators. It is run by the NJ Association of School Administrators and the people who go are largely administrators. It feels like that has a direct correlation to the types of events that were offered. I know that I’ve been a tad spoiled by the unconferences; the sessions are offered by current practitioners and tend to leave you with concrete ideas that are immediately applicable in a classroom. That is not Techspo. Because of the preponderance of administrators (read: the people who influence purchasing decisions), the perception that I had was that we were being sold. There were 3 different sections of vendors setup so that you could not go from session to session without seeing vendors, some of whom became more desperate to talk as the conference went on. Breakfast was behind the biggest vendor section. We had a 2 hour lunch; the official response from the director was that it was for networking. I do partially believe that it was the intention; however, it seemed that most people stayed primarily with the groups that they came with (I went by myself, so I really did try to network). A 2-hour lunch served among the vendors seems like trying to funnel us to the vendors. That was compounded by the sessions. I met with many people of the two days and we did not all choose the same sessions. We did all have sessions that seemed like glorified vendors pitches, though. Some sessions were actually partially run by vendors. I avoided those, as I always do. Others, though, seemed like vendors presentations in disguise. When I arrived at the first session I went to on the second day (out of respect, I’m leaving out the title and presenters’ names), I was handed a vendor packet by two salesmen in suits. That sets off bells in my head. The presenters then seemed to continually plug the product (call for pricing – it’s not on the website) thorough their session. In speaking with several people, the general feeling was one of being underwhelmed. I do not want to sound overly negative. I met more local technology coordinators than I have in the past and that network is valuable. I spent lunch today with Peter Renwick, a principal in North Jersey, and had a wonderful conversation. I enjoyed the conversation we had during my session about making assessment more collaborative and more focused on actual learning. An Apple engineer stayed to talk for half an hour after my conference and that was tremendously interesting. I spent the morning before the day started conferencing with a few other teachers and administrators on how to structure and teach research in middle school, which was very valuable. Bill Krakower, Dana Sirotiak, Samantha Morra, and others really did their best to make it an outstanding conference. There were definite high points and there were some very passionate people there. Next year, though, I’ll be returning to Educon this time of year. I would be interested in comments from others who were there. What was your experience? Back in September, I wrote a post about a tool I was working on to collaboratively assess technology standards. Originally, this stemmed from a desire to quantify how well our graduating 8th graders are meeting the state technology standards (which are surprisingly good in NJ). Expanding from 8th grade standards to cover the other grades as well. In NJ, the technology standards are assessed by the end of preschool, grade 2, grade 4, grade 8, and grade 12. Expanding beyond technology to other courses that are standards assessed. The ability to add or remove standards. While the Common Core brings much similarity, each state may have specific things that need to be assessed. The ability to add users, courses, and mass enroll students in courses. The ability to run specific reports. Thanks to the feedback from teachers using the tool, the next version is shaping up to be a major upgrade that will massively increase the tools’ value to teachers and students alike. My hope is that eventually this can be an alternative or counterbalance to standardized assessments. It provides the context, evidence, and voice from teachers and students that standardized tests do not. I would love to take more pilot schools on at the moment, but my focus has to be on making these improvements at the moment. I plan to unveil the new version at the TechSpo conference in Atlantic City on January 31. I will have a followup post the same day and hopefully be ready for more schools who are interested in trying it with their own students. Recently, my superintendent asked me to create a way to assess how well our school is preparing our students in the areas of technology and literacy. In NJ, many schools are using a defined set of common core standards in the areas of technology, research, and writing to assess this. In order to better assess our instruction and the students’ readiness, as well as to allow it to better inform our instruction I built the tool you see in video below. Each of these strands are comprised of a set of standards. The teacher or teachers, ideally in conference with the student, would document how well the student is progressing towards mastering each standard via descriptions, as well as links to evidence, whether that is an online document, picture, video, or something else the student has done or created. This data can then be exported or revised at any time. It is my hope that this data, since it is created by both the teacher and student, will be much more relevant than a multiple choice test. Currently, I just finished the 8th grade version. I will likely expand it to other grades (probably beginning with 12th and 4th/5th) if there is interest. If you or your district are interested in piloting this solution, please leave a comment or send me an email. I know I have not been posting a lot recently, but there has been a ton of things going on. Working with Clerestory Learning, we are about ready to launch the second version of our online instructional design tool, the Architecture of Learning Design Table. The library just got in 4,000 books (which is a huge deal when it only had 6,000, most of which were out of date) and I was able to recently put in an order for comfortable furniture and decorations to make the library a more fun and inviting place for my kids. Between teaching, running the library, consulting, and programming, I’ve come up with a new venture that I am very excited about. EasyPD is a new company that I am starting. Teachers are hungry for high-quality professional development that is differentiated according to their needs. I know a lot of amazing educators through Twitter, this blog, conferences, and other networks that I am a part of. However, I realize that not every educator who wants to to improve knows how to find the resources to do so online. That is a big reason I wrote Professional Development 2.0: Take Control of Your Learning. EasyPD will take a different route than most of my previous ventures. Without disclosing too many details while I am still building the platform, EasyPD will offer guided online courses direct to teachers, providing both high quality professional development and continuing education credits in as many states as possible, at a much more affordable rate than conferences and graduate school. So, this tool will be geared towards those teachers who want to improve, but need someone to help them individually. EasyPD will offer short courses – likely 6 weeks long – on topics in educational technology, pedagogy, assessment, and specific content areas. We will have both a schedule of courses that educators can sign up for and a course catalog from which they can choose from. If a class is not being offered in the time frame that someone wants to take, they can request it and it will be offered if there is interest. That is as much as I can disclose at the moment. We are currently projecting a launch in mid-late June and offering our first course as a discounted beta in July. A full launch will happen with the beginning of the next school year. Before I launch EasyPD, I would like a little help making sure what I am thinking is actually something people would want. I believe it is, but I want to make sure that I am providing a great value for teachers. As an educator, I highly value their time and want to make sure that it is well spent. If you can, please fill out this quick survey. Pottermore debuted a few months ago as the exclusive site to buy the Harry Potter books. I’m on break from teaching at the moment and I decided to try it out. I came away from the experience more impressed than I have been by a storefront in a long time. Let me preface this with a little background. Despite being a librarian, I do my personal reading almost exclusively with e-books. I’m personally invested in the Kindle store; I like their selection, Whispersync comes in handy, and I can read anywhere on my computer, phone, Kindle, or iPad. My wife is invested in the Nook store, the offering from Barnes & Noble, which offers similar features. I have also tried out Apple’s iBooks, Google Books, Sony Reader (my grandmother has one), and various other apps for many platforms. I have published a book in the Kindle store and have converted other writers’ books to epub for direct download and submission to the Nook store as well, so I am very well acquainted with what it takes to do so and what the advantages and drawbacks are. As a librarian, I usually turn down vendors flat when they approach me about e-books because I want to actually own the books and they are offering a poor, proprietary solution. I don’t want a solution laden with DRM that can only be read on one platform. If something happens to that platform down the road, what happens to all the books we’ve bought? Further, if a student brings me a device, whether Kindle, Nook, iPod Touch, etc…, I want to be able to load the book onto their device. To do that, at the moment, would really require having the .epub file without copy-protection on it. There really is not an ideal scenario for this. Pottermore solves this problem in an innovative way, even if it only impacts a small number of titles. When you buy a book from Pottermore, you link any major ereaders accounts (Kindle, Nook, Google, Sony) and you can instantly send the book to any of them. It easily works as well as buying directly from Amazon in my experience. You can download the file directly to read on a computer, Apple’s iBooks, or any other device that can read .epub files. In addition, you can download the file multiple times. In a few seconds, I was able to send the book to my Kindle, my wife’s Nook, and test it out in iBooks. Really, that is how it should be. When I purchase a book, I want to own the book and be able to use it as I choose. J. K. Rowling made this happen. How Did She Accomplish This? There are 2 advantages that Rowling has that most authors do not that allowed her to make this happen. First, she wisely kept the e-book and audiobook rights to her series. Most publishers bundle those into their contracts, so it is difficult for authors, especially new authors without a lot of clout, to do that. This let her have the legal right to create Pottermore and to gain almost the entire profit from the sale, as opposed to the 15-20% that most authors get from the publishers. However, just creating a site is not enough. There is no guarantee the distributors are going to want to work with someone or give them access to their platform to send books. The e-book distributors all like to tightly control their environments. This brings us to her second advantage: she is J. K. Rowling. She wrote arguably the most popular series in a generation. No major platform wants to say that you cannot read it on their platform. So, Amazon and B&N bowed to her demands. They have links on their site to Pottermore to buy the Harry Potter series. They would not do this for most authors; they lose profit, control, and, arguably, mindshare. It also would make it difficult for consumers if every author had their own site. Publishers are in a bad situation as their circumstances change around them and they continually seem to stagnate rather than adapt. As the balance of power shifts to favor authors, more will be able to do as Rowling has, perhaps even jointly. While I don’t think it will become commonplace in the next year and I don’t plan on giving up my Kindle anytime soon, I do feel that Pottermore shows up a glimpse of a possible direction e-books could go in. If it is a direction that gives more power to authors and choice to consumers, I am all for it. Currently, I am working as a library media specialist in a K-8 school. I’m teaching library, technology, and research classes to students across all the grade levels. Planning for next year, I am trying to convince my administration to let me teach an elective programming class next year to interested middle school school classes. Before I get into my reasoning, I would like to give a little background. As a school that is listed as in needs of improvement, the main focus for the new superintendent is on improving students’ ability in literacy and mathematics. There currently are not many electives offered in the school, so the students have little freedom in terms of what classes they take. This is mostly due to limitations in the number of rooms and teachers in the building. Depending on the students who choose to take the course, I would probably start with either Scratch – a visual programming language – or an introduction to web design, starting with HTML and CSS. From my own experience programming, I believe that practicing programming can help with both mathematics and literacy understanding. Having taught reading and language arts classes for several years, close reading is a skill that does not come naturally to many students. Programming forces students slow down, both when reading and when writing, and pay close attention. They need to be attentive to words, syntax, and the relationships between words. These skills definitely translate back to reading and understanding in more traditional contexts. Furthermore, all programming languages are based on logic and applied mathematics. This sounds complicated, but it really is not. It reinforces basic concepts that can serve students very well in many contexts. For example, last week, I was writing an application that required drawing something on the screen. To do this, I had to put in the coordinates on a Cartesian coordinate system. This was the first time I had used a Cartesian coordinate system outside of a school setting. There are many such examples that both reinforce mathematical concepts and show students their value outside of math class. This is a very simple construct. It simply means, if a variable is less that 5, do something. lf the variable is 5 or more, do something else. Helping students to have an understanding of reasoning will serve them very well. Lastly, Ira Socol made a great point in one of his recent posts. Programming helps students get away from a paradigm in which there is a right and a wrong answer. When you write code, it either works or it doesn’t work. It allows students to creatively problem solve and to safely learn through failure. There is often no single way to solve a programming problem. Students may have to fail several times before they find a method that works. This is a daily fact of life for me (I spend a lot of time writing applications and websites). Every time something does not work, I learn something else. There may be a more elegant or efficient solution, but allowing students to solve problems in different ways and learn from each other can be invaluable. Creativity, problem solving, and perseverance may not be in the curricula, but they are certainly worth teaching. I think that these skills can serve students well. It gives them a vehicle to concretely apply concepts from other classes and to do something meaningful with it. Simultaneously, they can be pursuing their own passions, finding new ways to solve problems, and reinforcing content area skills. What do you think? Is it worthwhile to teach programming to middle school students (11-14 years old)? If you have done so, have you had success and what languages did you focus on?